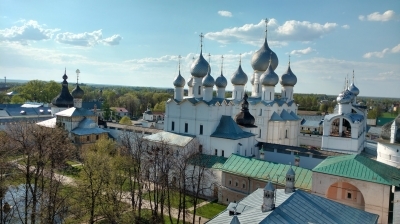 Rostov Kremlin is part of the Tentative list of Russia in order to qualify for inclusion in the World Heritage List. I think I had my first real encounter with Russia in Rostov. I was walking from the train station to the city along the principal road and was fighting hard to pull my luggage: The main road to the town center was a dirt road. Frankly, I am only used to see those for agricultural purposes or for pedestrians. Not as principal roads of a city. Rostov itself is pretty sleepy: little tourists, little traffic, little entertainment options. But it has a great Kreml in the middle of the city outshining in white and blue all other buildings of the town. Not sure if the list needs yet another Kreml with plenty of them inscribed already. But: Rostov felt distinct from all other sites I saw on my brief foray into Russia. It really felt like a fairy tale castle. Rostov is close to Yaroslawl and can be combined as a visit from Moscow. The connections being as they are I think you will not manage to do that as a day trip. The trains don't run all that often. Also, be aware that getting a train ticket in Russia is quite an ordeal, so have some buffer time wise. I had more than 30min in Yaroslawl and it was still a close call. I stayed over night in Rostov and left the next morning by bus to Sergijew Possad where I left my luggage at the train station. The Kreml is on the Nero Lake and it's a nice walk along the shores to the Monastery of St.Jacob Saviour. Not sure if this is part of the official nomination, but I would encourage you to visit.